Job hunting is rarely fun for anyone, and even more so for someone that just lost their job. A sudden job loss is upsetting due to the loss of income, for sure, but it also has a negative impact on our self-worth. We are no longer the family provider, or we feel like we just were not good enough to do the job, or we were a victim of a corporate downsizing. We get scared when we think about the future and worry about finding a new job. Unfortunately the more a person worries the less successful they are at actually finding a new job that they enjoy and are able to pay their bills with. 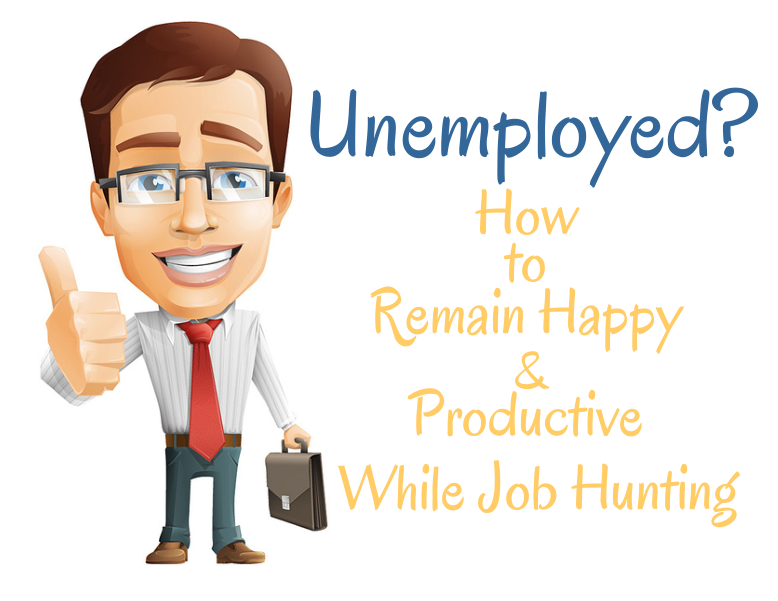 If you are unemployed and in the midst of job hunting it is very important for you to find ways to remain happy and productive as you search for a new job. Here are some tips to help you do that. Take an aptitude test to make sure you are looking for the right type of work for you. Speed up your job search by making the calls that you are afraid to make. Practice being kind to yourself and everyone around you. Speak to a job counselor, coach, or therapist. Learn new skills by attending conferences and workshops. Work on your self-esteem and believe in yourself. Consider transforming your current skills into a small business. Join professional organizations to meet new people. Stop worrying about the future, because worrying won’t change a thing. Reassess your goals both personally and financially. Keep in touch with friends and family. They may know someone that is looking for new employees, plus they will be a good source of inspiration. Update your appearance, and always look your best when you are out and about. You never know who you will bump into. Break-out of your comfort zone. Create a plan for your job search and stick to it. Contact headhunters to discuss the job market, your skills, and your availability. Find a part-time job, temp job, or even start freelancing, to supplement your income while you search for full-time work. You might find that you earn more at two part-time jobs than you did at your last full-time job. Attend free webinars and free online classes. Do volunteer work at least once a week. You will meet new people, develop new skills and it will help put your life into perspective. Be proud of yourself and let it show. Speak positively about yourself and your capabilities. Stop blaming yourself for past mistakes and poor choices. Be creative and be open to new opportunities. Take care of your health and boost your energy by eating right and exercising. Ask potential employers about the skills they are looking for that you do not yet have, and work on obtaining or improving those skills. Speak to people that can offer you emotional support. Try relaxation techniques, reading a book, taking a walk, going out for coffee with a friend. Make a list of all of your accomplishments up until this point and pat yourself on the back. Read books that relate to your line of work. Take a day off from job hunting and go see a funny movie in the middle of the afternoon when ticket prices are lower. Practice your interviewing techniques with someone that can provide you with useful feedback. Get up early each day and get a fresh start. Try new things that can inspire and motivate you to remain happy while you continue your job search. Adopt a frugal lifestyle and save your money. De-clutter your home and have a garage sale, or sell stuff online. That extra cash will definitely help you out. Learn how to use social media to expand your network and make new connections. Upload your resume to job search sites and monitor the new job postings every day. Remain focused and celebrate even the smallest accomplishments every step of the way.